Track a progress of the image uploading. With Magento AJAX image uploader you can stay calm. 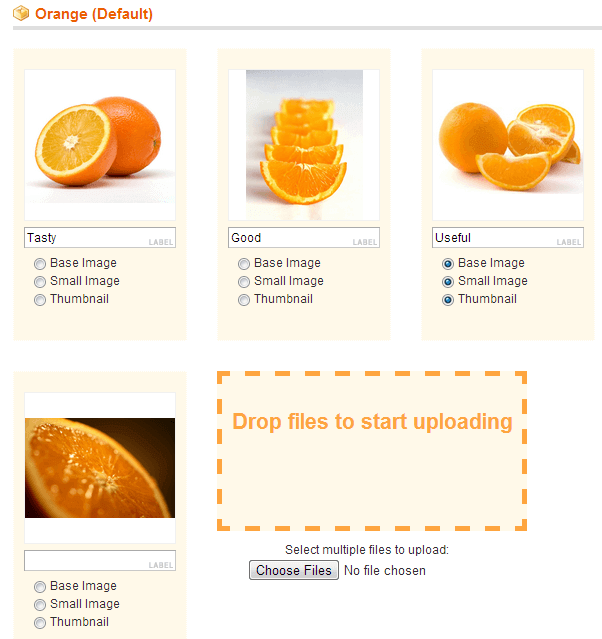 It will save your time and make inevitable process of image upload a lot easier. Drag pictures from the file browser on your computer straight to the Magento product page and drop the images there. We did some experiments - it took us about 10-20 seconds to choose and upload 8-10 product images. No possibility to use drag-and-drop? 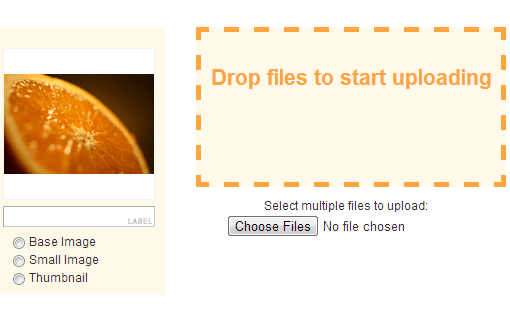 Then feel free to browse for the necessary files and upload images with our AJAX uploader. 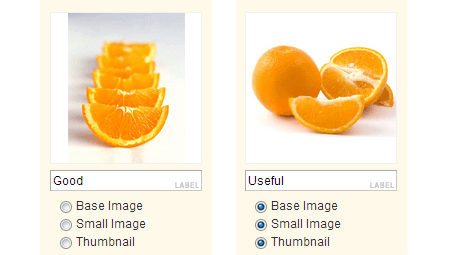 You can use Magento upload image tool for single or multiple images at once. The extension provides you with aesthetics and benefits of modern technology (like Google Picasa), saving your time, making life easier and more beautiful. Images are displayed in a grid instead of the standard list view - looks a lot nicer and is more functional. Features are self-explanatory and take no time to understand. Some browsers (e.g. opera) don't support drag-and-drop, some of you may decide not to use it for various reasons. So there's possibility to browse for the necessary files (in a traditional way) and then upload images via our speedy AJAX uploader. This option allows multiple file upload (considering that your internet browser supports HTML 5). You can change sort order of an image by just dragging it to the appropriate position. Not that you will need to wait for a long time, but still ability to track progress is always a good thing :). AJAX Scroll will change the way customers browse your catalogs making them more user-friendly. Content is loaded on request and there is also a nice-looking "Back to top" button. Quick Ajax Login provides your customers with best sign in experience ever. They will be able to login and register from any store page. Moreover, they can do that using their social networks which increases registration rate. AJAX Shopping Cart lets customers rapidly add products to cart with no useless page reloads. After adding a product to cart, users will get two options: Continue Shopping and View Cart. I like the module and it's functionality has already helped me to save lots of time. However, i would be very grateful if you added a frontend drag-and-drop option, that would be perfect. For now I give 4 stars. We’ve tried several similar extensions, including free ones, so far this is the best. In reality many extensions crash, or fail to upload, or sometimes freeze, or have issues with browsers, so far this product hasn’t let us down. The only thing that confused me is the price. I think it should be cheaper because basically this product uploads images only, and there are other extensions with wider functionality and the same price. As you know web stores which work with flowers need updated product images as much as possible. 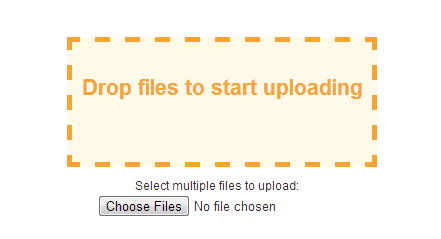 But a default magento image uploader picks too much time for this action. Using Ajax Image Uploader is our daily assistant. There are no days, when we don't use it. It is rather easy to upload new images to my store now. We like to present customers more and more interesting images for our products to involve them to buy products. It seems like you can also upload images with default magento uploader but using Ajax Images Uploader it will be done rapidly. Great way to fast and easy image upload. No more endless process to image uploading. A few minutes and everything is done. Thank you for facilitation our daily work. It is difficult to say a lots of words about this extension. But it works as a bee. Ajax Image Uploader it is just the extension for for those who don't want to thinking about updating images for products. Easy, quick, with out problems. My web store has a big amount of products and as you know, products images help customers to know more about items which they want to buy. Previously I spent a lot of time to upload all new images for my products. But this extension helps me to do the same but save time. Now I don't think about uploading new images. It takes just a few minutes to upload hundred new images. Perfect drag-and-drop feature is allow quickly upload all necessary images. It seams that extension very simple but the potential it has really great. Now it took less time to upload images for my products. And all downloading process are visible. It is clear how much time it will take to finish image uploading. Easy, fast and very convenient extension to upload new images for products. It took just a few seconds to upload an image. 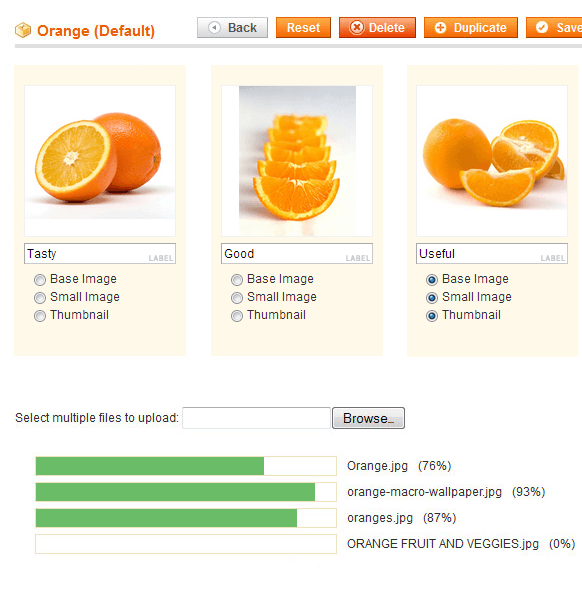 I can say that is is the best image uploader for magento i even used. And also except upload functions the extensions has features to manage products' images. It's a very handy little app, thank you for putting in the effort to write it. This is one of those handy tools that save you tons of work. All past tense with this wonderful tool. Just drag your file, drop it, and it works. Thanks to the dev for making something that simply works.